Alcohol consumption in Russia, despite the increase in retail prices, shows no signs of diminishing. Russia’s budget revenues increased by almost 25 percent in the first three quarters of 2012 as a result of a higher excise tax on alcoholic drinks, according to the most recent Russian Federal Treasury statistics. If this rate continues, the Treasury will be in possession of an additional 250 billion rubles ($8 billion) by the end of the year. 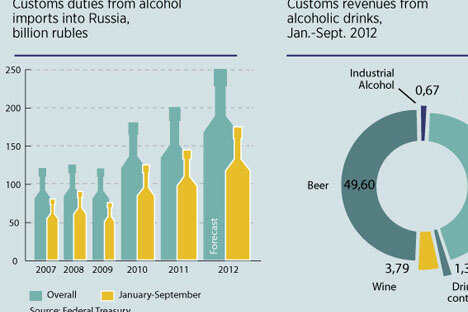 Alcohol consumption in Russia, despite the increase in retail prices, shows no signs of diminishing.